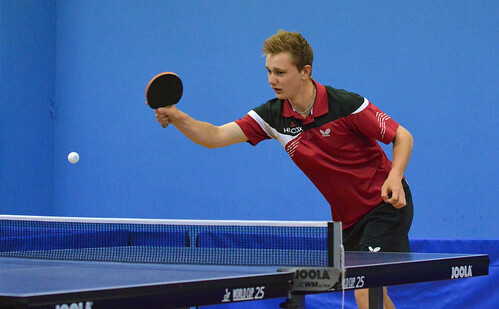 Alex Robinson and Dawn Morgan were the big winners on finals night due to picking up 9 of the 20 Island crowns between them, however it was 18 year old Joshua Butler (pictured) that came away with the coveted Men's Singles title in the last match to finish. Butler was up against fellow teenager Joshua Stacey and the cagy encounter was hard fought throughout, with neither player seemingly able to gain any substantial leads in any of the legs. It was though Butler who held his nerve and played the big points very well on each occasion. Stacey may well rue a missed forehand topspin in the opener whilst holding game point at 10-9, as Butler clinching it 12-10 gave him the advantage and momentum to see him through. The following 2 ends were nigh on identical with nothing between the players and despite Stacey's best efforts, he could not pinch an end and lost out in both 11-9, 13-11. With just a single end required to pick up his first Island Men's Singles crown, Butler was required to dig in and pulled back a rare deficit to earn himself a match point at 10-9. Stacey showed good composure to regain parity at 10-10, however another point from Butler brought up the 2nd match point. A timely timeout from Butler settled him nicely and he sealed the win upon his return to the table, closing out the game and match 12-10. Robinson and Morgan combined to win the Mixed Doubles title and won a further 4 titles a piece on an evening of great success from players at differing ends of the age scale. 18 year old Robinson went through the evening unbeaten and his form throughout bodes well for the upcoming Green Trophy Inter-Insular clash against Jersey. He opened up alongside Ben Foss where they clinched the Under 18 Open Doubles against the surprise finalists of Joseph Bourgaize and Stuart Sarre 4-0 before meeting his doubles partner in the very next round of the evening. This Under 18 Men's Singles match was a classic and arguably a contender for match of the night. Robinson looked in cruise control after winning the opening 2 ends comfortably, however Foss stormed back to take the 3rd 11-2. The 4th turned out to be pivotal in the context of the match as both players were starting to display their best form, with each regularly involved in lengthy rallies. Foss was also getting on top in the majority of rallies and Robinson will have been relieved to come through the epic 16-14. Foss refused to go down quietly and took the 5th 11-9. The 6th was another humdinger, but Robinson was playing a much more positive game at this stage and his more aggressive tactics worked a treat in closing it out 11-8. The Men's Doubles was his next crown as he teamed with fellow Lions player Liam Robilliard during a 4-1 win over Phil Ogier and Jez Powell. Both players were in excellent form throughout, both attacking frequently off both wings with razor sharp accuracy. The Mixed Doubles title alongside Morgan was his penultimate one and they were required to stave off the brave challenge of Ogier and Sam Kershaw en route. The victors were never behind, but did need 6 games to eventually come through. Robinson's last match of the evening came in the final session of the evening and he dispatched an out of sorts Lawrence Stacey for the loss of just 12 points in the Under 21 Open Singles. Morgan kicked off with a straight game win over Kay Chivers in the Women's Veterans Singles and followed up with another straight game win in the Over 50's Open Singles, Chas Elliott the player to taste the full force of Morgan's forehand smashes. The next match saw her up against last year's Men's Singles champion, Ogier and it turned out to be a surprisingly close affair, another of the matches that could be classed as a strong contender for match of the evening. Ogier looked to have everything in hand whilst leading 3-1 and with a comfortable lead in the 5th, however Morgan clawed it back and did exactly the same in the 6th when overturning a 7-3 lead to take it 11-7. Ogier showed strong mental strength as he was not affected by his failure to close out the previous 2 ends and roared through the decider 11-3, not giving Morgan the chance to put herself into contention. Next up was the main Ladies event, the Women's Singles and the opposition was Chivers once more. Chivers had put the earlier straight game defeat out of her mind and she started strongly in opening up a 2-1 lead. Morgan was determined not to let this affect her and she powered through the next 3 legs with few problems to pick up title number 3 of the night. After her Mixed win with Robinson, the final title of the evening came alongside Chivers in the Women's Doubles. Their opposition was Chloe Le Tissier and Charlotte Casey and despite the youngsters best efforts, they were defeated 4-1. Le Tissier had earlier seen off the challenge of her doubles partner in the Under 18 Women's Singles in another match that was closed out in 5 games. There were plenty of other superb matches in the remaining Junior events and none more so than in the Under 11 Open Singles final. The top 2 seeds of Ben Sharp and Caden Brouard respectively put up a tremendous display of table tennis with lengthy forehand rallies dominating proceedings. It was Brouard who won the big points and this helped him towards a tight straight game win. Brouard's elder brother Corey later contested the Under 13 Open Singles final against his elder and more experienced opponent, Luke Bichard. Having lost the opening 3 ends, he showed immense fighting spirit to pull it back to 3-2, however at this stage Bichard raised his level and closed the 6th out 11-4. Bichard's brother Ryan came up against Foss in the Under 15 Boy's Singles final and he had no answers to Foss on the evening, whose form saw him run out a comfortable straight game winner. The Under 15 Girl's Singles was one of just 3 matches to be decided in the 7th and deciding leg and it was Daisy Kershaw who picked up the win as expected. She was up against Alderney's Marli Barker who put up a tremendous fight despite losing out. She led 2-1 and battled hard to force the decider after winning the 6th 12-10. It was not to be her night though, as the Guernsey girl stormed through the 7th 11-4. The Restricted Open Singles was introduced last year and is for players over the age of 21 and under 40. It has the stipulation that players to have competed in the Green trophy during the past 2 years are unable to event, currently ruling out a few top Island players. Paul Hainsworth picked up the inaugural title last year and he followed up with a convincing straight game win over Ben Foote this year. Phil Ogier and Jez Powell made up for their defeat in the Men's Doubles with a comprehensive straight game win over the St Pauls duo of Chas Elliott and Maurice James in the Veterans Open Doubles. At the older end of the spectrum, it was GTTA tournament secretary Ian Fitchet that was the big winner. He picked up the Over 60's and Over 70's Open Singles on the night. His first match was in the Over 60's Open Singles against the top seed for that event, Elliott. The match was the 3rd and final match of the night to be won in the decider and despite having lost ends 18-16 and 14-12 during the encounter, he was in cruise control in the final leg and took it 11-3. His opponent in the Over 70's was Maurice James and despite the St Pauls player's best efforts, it was not enough against Fitchet, who took it 4-1 with incredibly all of his games being won by the score of 11-8.